For more than half of the 20th century, the 2½-ton 6x6 truck was the backbone of U.S. military tactical transport. The pace-setter for this type of vehicle was the GMC CCKW, which not only served as a transport, but also formed the basis for a myriad of specialized vehicles, from air-transportable versions, to multiple engineering variants, mobile medical facilities, antiaircraft weapons, and trucks that fulfilled a host of other tasks. 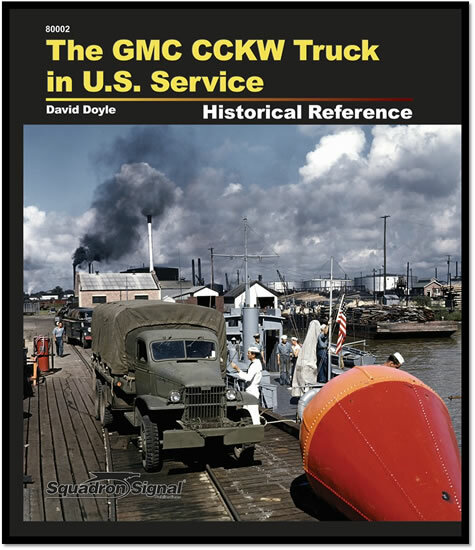 The CCKW has been the subject of a number of books and articles over the years, but this volume - the second in Squadron Signal’s new Historical Reference series - is the first to draw on the archival records of General Motors to trace the truck back to its roots in the 1939 ACKWX and then tell its story through its debut in 1941 and the varied services it rendered with U.S. forces in all theaters in the ensuing decades. GMC’s obvious role is covered, but so too are less-known stories, such as the contribution made by multiple Chevrolet facilities to CCKW production. The massive book exhaustively describes the development, production, and U.S. use of the CCKW, ACKW, AFKWX, and CCW in World War II and Korea with an in-depth narrative of more than 100,000 words, illustrated by over 1,200 vintage color and black-and-white photos most of which have never before been published. Illustrated with more than 1,200 photographs plus detailed line drawings; 504 pages.